Officers Alice Panaro and Shawn Knepper direct traffic during outage. Power was out at the Pitt-Greensburg Campus on April 7 when a transformer blew on Mount Pleasant Road. A Pitt Emergency Notification Service alert was sent to inform students that power was out and that classes scheduled at 5:30 and 7 were cancelled. The stoplight on Mount Pleasant Road in front of campus was out. 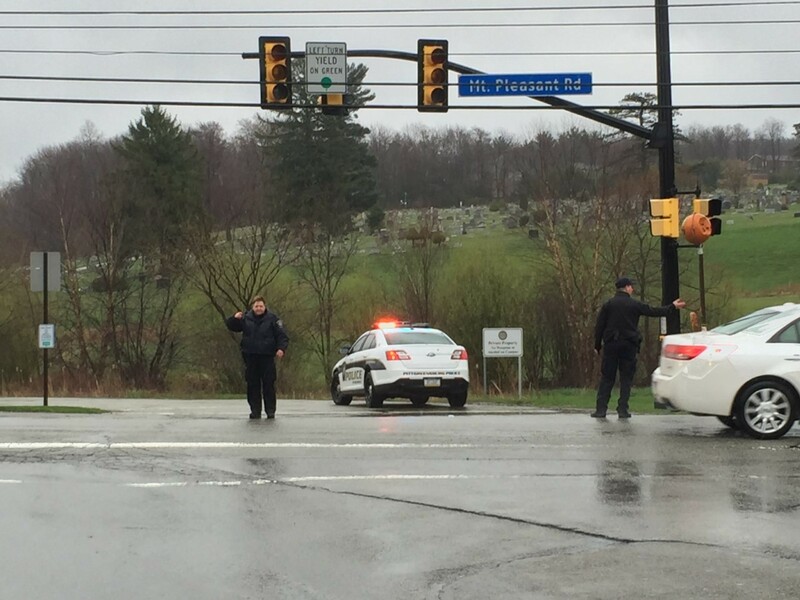 Pitt-Greensburg officers directed traffic until the light was operable again. Campus Police Dispatcher Julie Godzik sent other on-campus officers to check the elevators. “What if the phones weren’t working [in the elevators]? We had to make sure that no one was stuck inside,” Godzik said. The premiere of the Pitt-Greensburg Theatre Company’s production of the “Man of La Mancha” was scheduled for 7:30 that evening. The tech director informed actors that if the lights did not come back, they would have to cancel the performance. Another ENS alert sent at 6:25 said that power had been restored to campus. The play went on as scheduled. According to a campus-wide email from Maintenance Coordinator Linda Soltis, the outage caused damage to the elevator in Smith Hall and left it unusable. The lift is expected to be fixed by Friday, April 15. Until then, the stairwells are the only points of access to the basement and second floor of the building.